David Foster’s novel Sons of the Rumour is billed as a “genre-defying work of genius”. I’d go further and say that it also defies description, which makes this review difficult to write. The first few hundred pages tell of the complicated relationship between the Shah and his wife, the shapely Shahrazad, who just won’t shut up. To find some peace, the Shah wanders incognito through the streets of Merv, a city in ancient Persia. Out there, in touch with his subjects, the Shah hears wonderful stories of journeys along the Silk Road, stories that overlap with the Shah’s domestic dramas. All in all, this gorgeously written section makes about as much sense as an inscrutable, byzantine dream. Then, on page 285, we meet Al Morrissy, a retired jazz drummer on a long-haul flight from Sydney to Dublin. Through the stream of Al’s consciousness, we come to understand a little about his equally complicated marriage as well as the mistakes of his past. As happens on long-haul flights, Al drifts into an unsettled sleep and, sure enough, he dreams of Merv. Foster explores the nature of the veil between the two worlds. He also explores the collision between the Muslim male and the Western woman, which becomes the backdrop for all male-female relationships—complex, bewildering, irreconcilable—whether in ancient Persia or modern-day Cronulla. 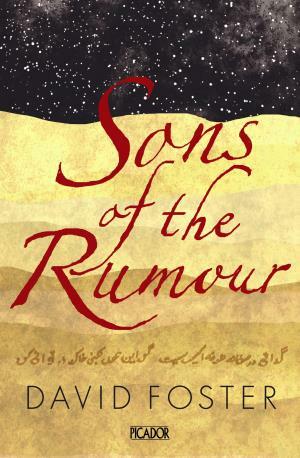 Foster is a writer of exquisite intellect and linguistic daring, and Sons of the Rumour is a brilliant masterwork. Although this novel is heavy-going most of the time, tedious as well as befuddling, the toil is well worth it. Foster is a giant of ideas and satire, of wit and wildly beautiful passages. Sons of the Rumour, David Foster, Picador, $39.99. Review first published in The Courier-Mail in November 2009.